Count on me, I will be as diligent as possible! 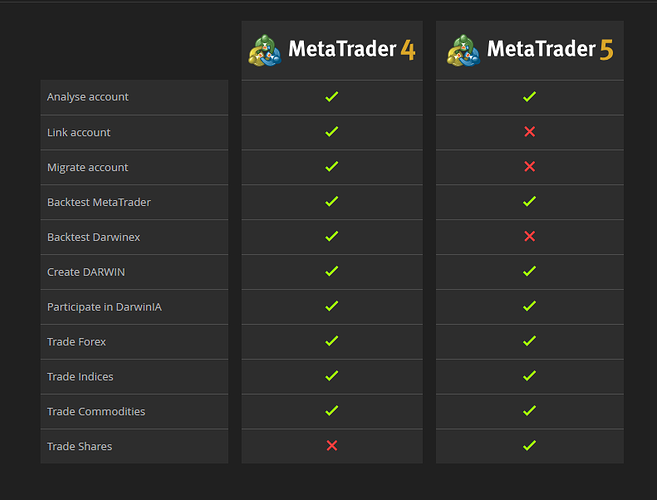 i just opened a demo MT5 account for stocks, wondering since it's an extra account, will it be possible to trade forex, commodities and stocks in one accout to create a darwin? Or will it be seperate at all? For now, they will remain separate, we'll keep you duly posted! hahaha @CavaliereVerde never miss one!! I have already noticed it 4 days ago. Is there any problem here? I don't want it to be invested, 2 months are noise but maybe there is some technical issue. Today IPO but when ? Today, hihi !! Since my Capacity < 1 (AuM 300k$ maxi ?? ), always always hihi, i build a factory of #FURAX: $UAF, $FAX & $FYN. I use too a 1:20 leverage (Esma) on MT5 for $FYN and i like it. Hi @CavaliereVerde, MT5 DARWINS are still being monitored to make sure they are correctly replicated. So is every mt5 darwin still "in progress" ? Thanks for your message. MT5 DARWINS are being monitored to make sure they behave like they should. We will send an official message when they are available for investors. I'm testing mt5 and I find that it has a big disavantage; all the trades in the same pairs are added in one position. So it's impossible to close the trades one by one. Is there a way to surpass this?